Here are more pics of us in Sydney courtesy of our friends (stolen via facebook). Thanks guys! The Wang family all decked out for Vanessa & Kevy's wedding. Clark is slightly burned from golf by the strong Sydney sun. The Wang family with the happy couple. Congrat VIP & Kevy! 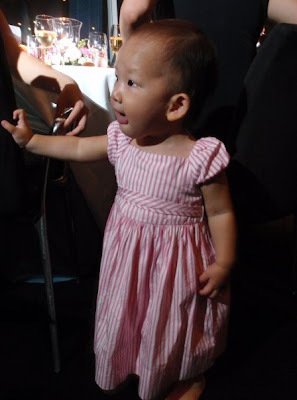 Natalie is a pretty little cutie patootie in her pink dress. She loved walking around and touching the wine buckets which were full of ice and telling us they were "ouwd" (cold). Daddy taking care of Natalie during the meal. Natalie can also say "juice" now. Natalie chilling with me. Pacifier in means time for sleep. She slept really well in her stroller while we danced the night away. What a good girl! The next day, we went to dinner at Red Oak for Clark's birthday. 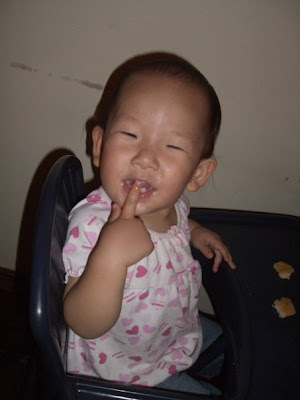 Here's a great shot of Natalie giggling in her high chair. She loved eating the home-made pork sausages... yum! 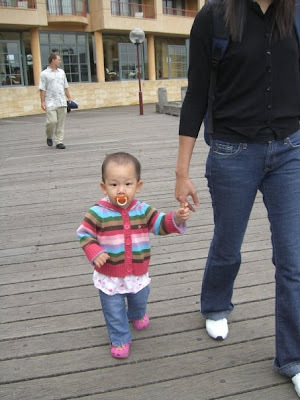 Natalie walking along the pier and looking like a big girl in her jeans and sweater (except for the pacifier and lack of hair). 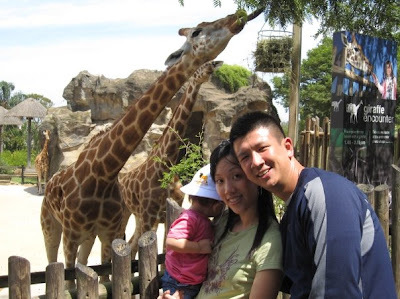 The Wang family at the zoo. As you can see, it was hard to get Natalie to look at the camera. The giraffes are so much more interesting! I agree, great photos! Natalie does look like a big girl now and awesome dress Tray!